Jodhpur School: Paintings on hand made depicting love scenes are more popular then the other art figures. Real gold and stone colours are used. 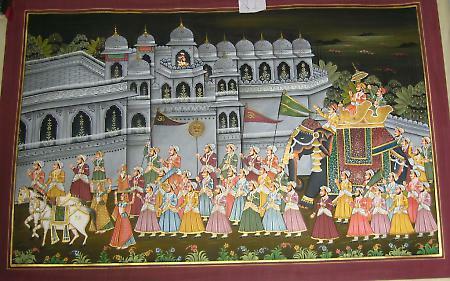 Jaipur School: gods and goddesses, kings and durbars are very beautifully painted on hand made papers by the artists. Artists have used real gold and stone colours. Kangra School: Real gold, stone, and water colours are brushed on old handmade paper .squirrel-hair brushes are used. Glittering effect is extended using silver and golden colours. Mughal School: - Love scenes and the Mughal durbar are depicted very beautifully on the silk using real gold and stone colors. This art today can be seen on the wooden background also.